A typical day at Footprints begins with a breakfast of low sugar cereal and a bread product such as toast, bagels, pancakes, muffins or croissants. After breakfast the working day begins with either outdoor play or a choice of stimulating and exciting activities from the shelves of the classroom, these include Montessori activities along with role play, books, craft, painting, sand and water. when the weather is suitable (most times of the year) children are able to take their learning into their outdoor free flow area if they wish. At ten o’clock, a snack is put out for the children to access when they are ready, this is followed by more free activities or lessons with outside teachers such as dancing, yoga or sports. We call morning activities in the top three rooms, our work cycle and we try to interrupt the children’s work as little as possible. Staff work with children to extend their learning or introduce them to new activities. Lunch is served at twelve o’clock after which the younger, under threes children have a sleep or rest. During the afternoon after a small snack when they wake up, the children may again access activities that interest them, some time is always spent outside or a walk to our lovely woodland may be planned. Tea is served at four o’clock followed by quiet activities or outside play until the children are collected between five and six o’clock. Parents are welcome to drop off their child or pick up their child at any time but we would ask that if you are going to drop off after 9am or pick up earlier than 5pm you inform staff in your child’s room. In all of our nursery rooms children are encouraged to use the indoor and outdoor space as much as possible. With free flow into outside areas in all but the worst weather conditions. 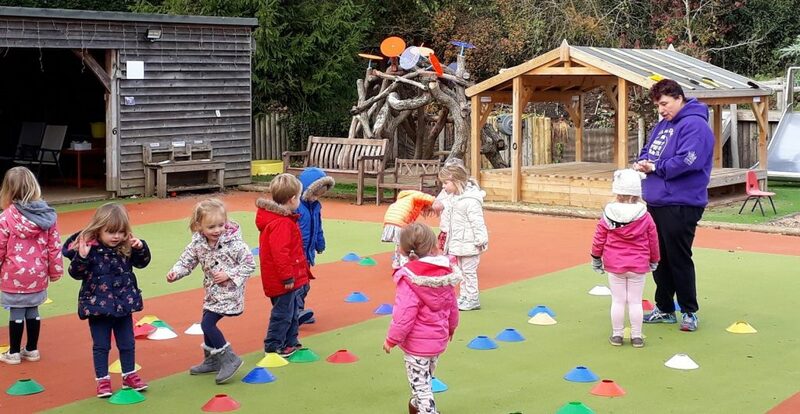 As we encourage outside activity all year-round, we do ask parents to ensure their children come to nursery in appropriate clothes for the weather and time of year. Visit the ‘what to bring’ section for more details. Where children will be staying for breakfast, lunch and dinner, we ask that parents do not provide any food or snacks from home. We have a dedicated on-site kitchen provides fresh daily meals and snacks for the children. "There is no doubt in our minds that your wonderful care, kindness, patience and guidance has helped to shape our daughter into the little person she is now, and the grown up person she will eventually become. We couldn't have wanted for a better start in her life - thank you."